In our picture the stone has been used to cover a wall. 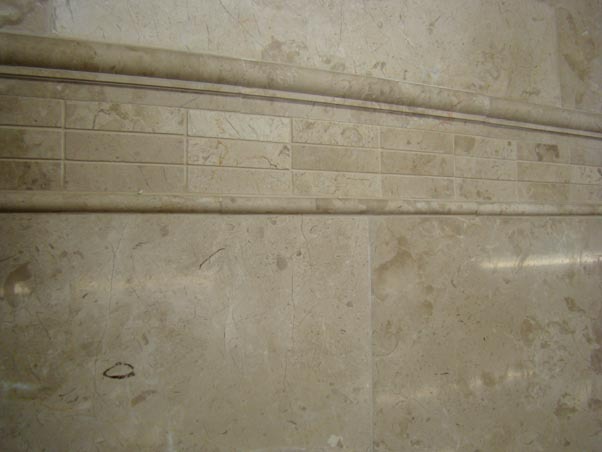 The tiles used were 610x406x12mm and half way up the wall we used a single pencil strip to start the marble border. Above the pencil strip we used three strips of the polished matching mosaic, and above that the P shaped solid marble dado finishes the border off. For a less intricate border we would recommend using just the P Step dado with tiles above and below. As a floor tile the large format honed finish in Constantine marble is perfect. Please feel free to call to discuss this or any other stone floor. This marble can also be viewed in our warehouse showroom in Harrogate. Samples are available though or online shop or by telephone.